I recently started a new job which obviously means a new bag. I didn't really have a bag that was big enough to fit my lunch and all my other essentials in - all mine were too big or too small! I spotted this bag in Topshop but didn't end up buying it as I wasn't sure if it was what I was looking for. After looking in lots of other shops it ended up being the only one that was a nice size and looked good quality. It came in grey, blue and pink but I opted for grey as I wanted a neutral colour that went with everything. I use it with the long strap and it's just big enough to fit my lunch, umbrella and all the other rubbish I carry around. My job also means im out and about a lot so I also carry a camera and notepad so i'm glad I got a bag with a bit of extra room! It has a couple of smaller pockets inside which are useful for my purse, phone and keys and it saves me from losing my keys in the bottom of my bag which always seems to happen! I've been using it for the past two months and so far it hasn't had any wear and will hopefully last me for the next year and maybe longer. Congrats on a new job! What a beautiful bag. I love the shape and hardware detail and for Topshop, I'm quite surprised at the price!? 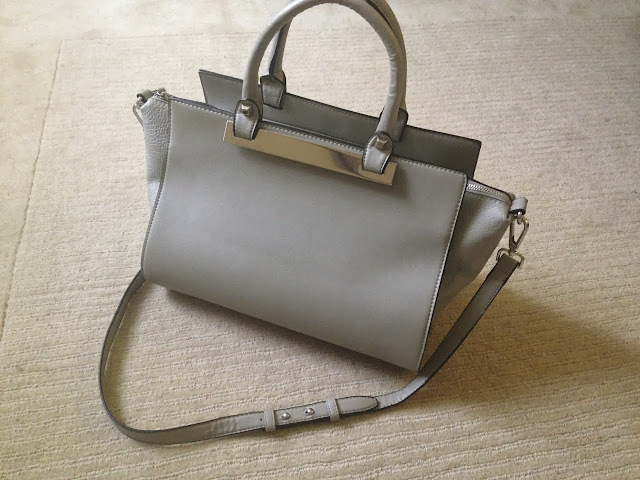 Ohh what a beautiful bag, such a lovely purchase! Congratulations on your new job!